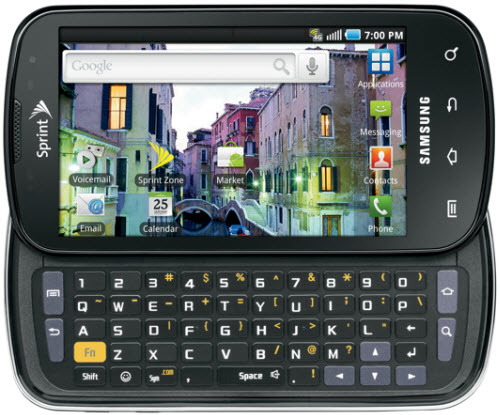 Back in August, Samsung launched the Android powered Epic 4G smartphone. This handset is exclusively available on the airwaves of Sprint in the US. Samsung Epic 4G is the second smartphone with 4G connectivity, after the HTC EVO 4G. This handset comes with an amazing 4 inch touchscreen display and a slide-out QWERTY keyboard. Epic 4G originally runs on the very old Android 2.1 (Eclair) operating system. If you are bored of using the older version of Android on this amazing smartphone, then we have a good news for you. As for the specs, Samsung Epic 4G features a 4 inch Super AMOLED display with 800×480 pixels resolution, 1 GHz Hummingbird processor, Android 2.1 OS, slide-out QWERTY keyboard, 3G/4G connectivity, 5 megapixel camera with LED flash, HD (720p) video recording and playback, VGA front-facing camera, 512 MB RAM, 512 MB ROM, A-GPS, microUSB, Wi-Fi, Bluetooth 2.1 with EDR, 32 GB expandable memory and a 1500 mAh battery. Now coming back to the good news, Samsung Epic 4G will officially get the much-awaited, Android 2.2 FroYo update starting from Monday, February 21st. The Android 2.2 update will allow you to access more than 150,000 apps from the Android Market, ability to load apps on the MicroSD card, Flash Player 10.1, Bluetooth voice dialing, GPS enhancements and more. The Android 2.2 update will be pushed over a 4-day period, so please don’t panic, if you don’t receive the update on February 21.